The other day, I was reading a post by Ethan Siegel on his excellent blog, Starts With a Bang, about whether it makes sense to consider the universe to be a giant brain. (The short answer is no, but read his post for the details.) Something he mentioned in the post caught my attention. But these individual large groups will accelerate away from one another thanks to dark energy, and so will never have the opportunity to encounter one another or communicate with one another for very long. For example, if we were to send out signals today, from our location, at the speed of light, we’d only be able to reach 3% of the galaxies in our observable Universe today; the rest are already forever beyond our reach. My first reaction when reading this was, really? 3%. That seems awfully small. What Siegel is talking about is an effect that is due to the expansion of the universe. Just to be clear, “expansion of the universe” doesn’t mean that galaxies are expanding into space from some central point, but that space itself is expanding everywhere in the universe proportionally. In other words, space is growing, causing distant galaxies to become more distant, and with space growing in the intervening space, the more distant a galaxy is from us, the faster it is moving away from us. This means that as we get further and further away, the movement of those galaxies relative to us, gets closer and closer to the speed of light. Beyond a certain distance, galaxies are moving away from us faster than the speed of light. (This doesn’t violate relativity because those galaxies, relative to their local frame, aren’t moving anywhere near the speed of light.) That means they are outside of our light cone, outside of our ability to have any causal influence on them, outside of what’s called our Hubble sphere (sometimes called the Hubble volume). Note that we may still see galaxies outside of our Hubble volume if they were once within the Hubble sphere. How big is the Hubble sphere? We can calculate its radius by dividing the speed of light by the Hubble constant: H0. H0 is the rate by which space is expanding. It is usually measured to be around 70 kilometers per second per mega-parsec, or about 21 kilometers per second per million light years. In other words, for every million light years a galaxy is from us, on average, the space between that galaxy and us will be increasing by 21 km/s (kilometers per second). So, a galaxy 100 million light years away is moving away from us at 2100 km/s (21 X 100), and a galaxy 200 million light years away will be receding at 4200 km/s (21 X 200), plus or minus any motion the galaxies might have relative to their local environment. The speed of light is about 300,000 km/s. If we take 300,000 and divide by 21, we get a bit over 14000. That would be 14000 million, or a Hubble sphere radius of around 14 billion light years. Okay, so the Hubble sphere is 14 billion light years in radius. According to popular science news articles, the farthest galaxies we can see are about 13.2 billion light years away, and the cosmic microwave background is 13.8 billion light years away, so everything we can see is safely within the Hubble sphere, right? Wrong. Astronomy news articles almost universally report cosmological distances using light travel time, the amount of time that the light with which we’re seeing an object took to travel from the object to us. For relatively nearby galaxy, say 20-30 million light years away, that’s fine. In those cases, the light travel time is close enough to the co-moving or “proper” distance, the distance between us and the remote galaxy “right now”, that it doesn’t make a real difference. But when we look at objects that are billions of light years away, there starts to be an increasingly significant difference between the proper distance and the light travel time. Those farthest viewable galaxies that are 13.2 billion light years away in light travel time are over 30 billion light years away in proper distance. The cosmic microwave background, the most distant thing we can see, is 46 billion light years away. So, in “proper” distances, the radius of the observable universe is 46 billion light years. It’s worth noting that, as the universe continues expanding, all galactic clusters will become isolated from each other. In our case, in 100-150 billion years, the local group of galaxies will become isolated from the rest of the universe. (By then, the local group will have collapsed into a single elliptical galaxy. ) We’ll still be able to see the rest of the universe, but it will increasingly, over the span of trillions of years, become more red shifted, and bizarrely, more time dilated, until it is no longer detectable. By that time, there will only be red dwarfs and white dwarfs generating light, so the universe will already be a pretty strange place, at least by our current standards. If our distant descendants manage to colonize galaxies in other galactic clusters, they will eventually become cut off from one another. If any information of the surrounding universe survives into those distant ages, it may eventually come to be regarded as mythology, something unverifiable by those civilizations living trillions of years from now. This entry was posted in Science, Space and tagged Astronomy, Cosmology, dark energy, expanding universe, Hubble sphere, Hubble's constant, Observable universe, Science, Size of the observable universe, Space, Universe. Bookmark the permalink. This is something I have wondered about for a long time. You say “Just to be clear, ‘expansion of the universe’ doesn’t mean that galaxies are expanding into space from some central point, but that space itself is expanding everywhere in the universe proportionally.” How one establishes this I am not sure, but if we do not know why space is expending, could it not be the case that the expansion of space is slowing, for some reason, giving the illusion that the rate at which galaxies are receding from one another is accelerating. If this were true would it obviate the need for dark matter and dark energy to explain that fact. Noe that I am old my brain seems to have calcified and I struggle to think through these things. Until the late 1990s, everyone assumed that the rate of the expansion had to be slowing down due to gravity. It was only a matter of how much. But measurement of the distance of remote Type Ia supernovae, most of which explode under very precise conditions, leading to very consistent intrinsic brightness, making them ideal distance markers, showed that the expansion was actually increasing. There was some unknown energy (dark energy) fueling the expansion, overcoming gravity. Thanks for this blog, by the way. It is a real service to us armchair theoreticians. However, the gravity between the local group and the rest of the Laniakea supercluster reportedly isn’t strong enough to do that. As a result, Laniakea will eventually be torn apart by the expansion. Or are you maybe thinking that the expansion or contraction might effect bosons (such as photons) but not fermions (protons, electrons, etc)? If so, we’re getting outside of my ability to speculate intelligently about it. The thought of bosons hadn’t crossed my mind. I was concentrating on EMR. Thanks for sharing, this is very interesting. I was wondering the same thing, but I assumed I was just an idiot and I wouldn’t have had the courage to ask the question. Thanks! One addendum to my answer above. The red shift is significant because things moving away from us would be expected to be red shifted. (Things moving toward us would be blue shifted.) This occurs because red has a longer wavelength and red shift indicates that the waves are being stretched. Across normal distances, this is undetectable, but with the right equipment and across astronomical distances, it becomes important. The more red shifted something is, the faster it’s moving away. You got a for real LOL at: “Okay, I’ll stop now.” I get it. That’s what I sound like when you get me started on Plato, except I usually don’t stop at the right time. I never would’ve thought of that question. Pretty amazing how we can tell the difference using a comparison of closer objects. But here’s one for you: What if the chemical makeup of the far away object would make it red (in other words, red is the natural color), and what if it’s also red shifted? Can’t say I was waiting for that one, but I think it’s a good question. In general, the farther away galaxies are, the more red shifted they are. I didn’t take into account that the object—red dwarf in our case—was a constant. You have all the answers! LOLS! Not at all. For example, I still haven’t figured out how to empty my shredder without making a mess. Or how to motivate myself to move beyond daydreaming and actually write. Just one thought about this: If things far enough from us can never be observed by us again then they should be, from our point of view, in a superposition of states that can never collaps. There should be many different histories going on there (from our point of view) just as we are only one of the many histories from their point of view (if you adopt a many worlds interpretation of quantum mechanics). There should be an area where only a small trickle of information is still coming out (because it is red-shifted so much that the remaining radiation has only a very narrow badwith remaining, or that time there, as observed by us, is almost standing still. More and more galaxies are “falling” beyond that sphere from our point of view and will disappear. The accelerating expansion of space would be the ultimate perfect box around Schrödinger’s cat, so to speak. Already the distant galaxies we are seeing would not be in any definite state from our point of view because we can only ever get a very small amount of additional information about them. That’s an interesting thought. It reminds me that many physicists, such as Max Tegmark and Brian Greene, consider regions outside of the observable universe to be other universes. In an infinite universe, the same pattern of atoms in our region should repeat themselves an infinite number of times, along with every possible variation. Tegmark pointed out that these repeat regions can be reconciled with the Many World Interpretation of quantum physics. In both, every variation of every outcome exists somewhere. It seems like it implies that some sort of entanglement must exist between these remote regions. One thing that I’ve wondered is, if galaxies that were once in our Hubble sphere are now being time dilated from our perspective, what does that say about galaxies well beyond our observational horizon? Following your thought, it might be a meaningless question for me to ask. Thinking about the long term fate of the universe can be depressing. It reminds me of that story: A little girl learns that someday the sun will die. She starts crying. Her father tells her not to worry because we’ll all be long dead by then. She cries louder. I thought that relativity started that velocities were all relative, and that no two points / objects in space can ever move faster than light speed relative to each other…? Been a while since I studied it, and I don’t think I ever grokked it. Set me straight? There is a rule, valid both in special relativity and general relativity, that says two objects cannot pass by each other with relative velocities faster than the speed of light…There is simply no such thing as the “velocity” between two objects that aren’t located in the same place…So there can’t be any rule that says that velocity can’t be greater than the speed of light. Period, full stop, end of story. That seems somewhat semantic to me, amounting to, “This velocity that violates our rule about velocities isn’t real velocity.” Semantics aside, there’s definitely something different about relative movement (or whatever we want to call it) caused by the expansion of space. It’s because velocity (or speed to be precise) is a measure of how fast objects are moving through space, and if space itself is expanding, then the total rate of separation between objects can be greater than the speed of light. I think I understand and agree with the concept you’re conveying. I suspect Carroll avoided the “moving through space” phrase because there’s no way to measure our rate through space, only in relation to other objects. Nothing can move faster than light relative to any object it can causally affect or be causally affected by. Galaxies beyond our Hubble sphere are causally disconnected from us, so their motion relative to us is irrelevant. Causally, they’re in a different universe. I like Ethan’s site. He tries to explain complex stuff in a way that it is accessible to folk like me. Thanks makagutu! Totally agreed on Ethan’s site, and that’s one of the best compliments someone can give me about a post. the long-term viability of the Terran fossil fuel industry, or that eventual outcome of the ideological feud between Sunni and Shia Muslims. “causing distant galaxies to become” i love such statements! why. of course, because that is the essence of our knowledge (causing…). and about very wise Ethan. 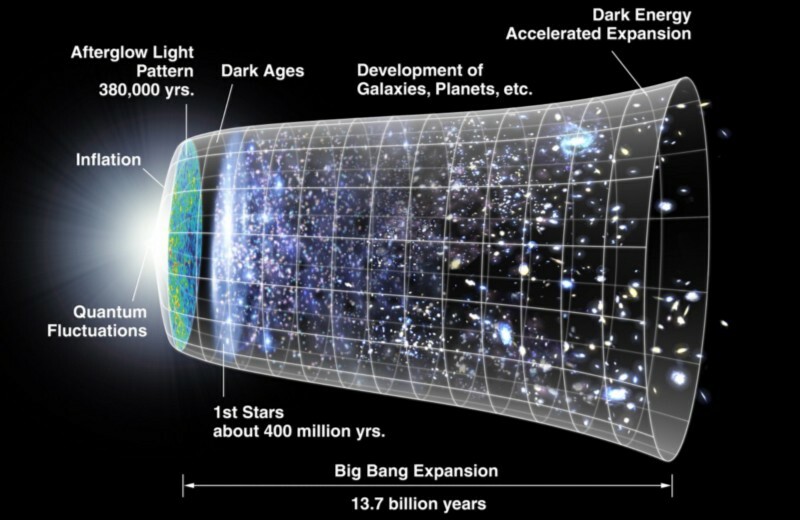 let’s look at photo (Timeline of the universe.) and Michael realize where there is a flaw in this (by Ethan claims)! Hey Stan. Totally agree that Ethan knows his stuff. Did you mean this image? What would you say is the flaw? Yes! Of course, this illustration shows the essence (even quintessence) of our knowledge and there is no flaw or error! but if you ask “what would you say is the flaw?” this means YOU missed the moment when Ethan’s genius manifested itself. So let’s summarize. there is no flaw in this illustration. the whole problem arises in Ethan’s brilliant approach to this problem (that shown in the illustration), which perhaps will result in a nomination for the Nobel Prize for this brilliant man. So you need any tips yet? So let’s look at the illustration. at the beginning is flash. then there is an area which is defined as quantum fluctuations and inflation. what I do understand that QF is the basis of inflation. but that isn’t important — and how do you understand the origins of our Universe. Well, what I understand the origin of the universe as we know it, is that it started in a hot dense state around 13.8 billion years ago and has been expanding ever since. There’s a good chance that there was a period of cosmic inflation in the first hundred millionth of a trillionth of a trillionth of a second. Speculatively, it all might have been caused by quantum fluctuations. Even more speculatively, eternal inflation might be the default state of space and we’re in a low probability bubble of low inflation (with other bubbles out there). and this is the correct way of thinking, generally speaking. unfortunately, Ethan this a little complicated. rather, he rearranged the course of certain events. but it’s too complicated, not to think about it more carefully! so returning to the reasoning of Ethan, the image should look like this: this does not flash at the beginning of. only remains of this area defined as (quantum fluctuations and inflation). and from it all begins. whether we are able to understand this? it may have been something very small, but it was not the beginning of the universe, only the beginning of inflation. so not in the original very small point were included opportunities for creation of the universe. only inflation this point created a power and resources which only created the universe! so whether it is understood or if i misunderstood arguments by Ethan. or rather, first, which part of my argument is incomprehensible, because it is probably? Stan, I fear the language barrier is getting us again. I’m going to try replying by breakdown. Hope it helps. If you’re saying this isn’t necessarily the beginning of the universe, only the universe as we know it, I agree. Right. It’s the only time things were small enough for quantum fluctuations to have been decisive. Of the observable universe? Agreed. Certainly it’s hard to piece together across billions of years what might have happened. Reiteration of the first point above? If so, agreed. Reiteration of second point? Agreed. Agreed. If inflation happened. Most physicists believe it did, but I perceive there’s still a little room for doubt. i’m afraid that’s not all you understand correctly (rather, not quite in the full sense), what is of course the result of my imperfections. additionally may be insignificant but important note – this isn’t my assertion only claim by Ethan. just incorrectly written by my degenerate mind! so i’ll have to add additional explanations and clarifications! sorry for excessive exploitation of your time!? No worries Stan. These discussions are worth is. Whenever you’re ready. Thanks for the link. Ethan describing the difference between the classic big bang and inflationary universe, as well as the evidence for the classic version. Also discusses the red shift and spectral lines evidence discussed higher up in this thread. whether you now understand what i mean? so do you see the difference between the image (above) and illustrations “Bock et al” and “ESA and the Planck collaboration, modified by E. Siegel” from “The Two Big Bangs”. but what is most interesting of all this is the cause and effects that underlie such reasoning by this great man. unfortunately, this is very complicated, so maybe on another occasion! Thanks Stan. I did actually understand the inflationary cosmos and its relation to the traditional understanding of the big bang. Did I say something that was inconsistent with it? Michael. omitting certain stages of events, maybe YOU could write something about quantum fluctuations? Maybe at some point. I currently don’t know enough to write intelligently about it. Lawrence Krauss wrote a book on exactly this. (I haven’t read it, at least not yet, because I find Krauss annoying.) Don’t know if there’s a Polish version. From googling the quote, it appears to from Krauss’s book. Madness in a good way or bad? the best answer probably is that i don’t think that a quantum fluctuation could create this universe (in practice). probably the best evidence provided scientists themselves, because estimating the power of empty space (in the mathematical universe) they were strongly surprised! As I understand it (and my understanding is admittedly shaky), there are two responses to that. The first is that you have to remember that the energy density of space today is infinitesimal compared to the energy density in earliest instance of the observable universe. The second is that something had to cause the change in state that led to the expanding universe. Quantum fluctuations are purportedly a good candidate because they just happen as part of normal quantum randomness; there doesn’t have to be a prior cause. All that being said, I need to eventually do some reading on this myself. before i give some details of … what do you think about this my opinion. whether it is linguistically correct? and whether any substantive sense? that the real reality cannot catch up with the feats of our feverish mind! Stan, not sure if your meaning came through. Are you saying that describing the universe with mathematics is our greatest intellectual achievement, but that it may not match reality? If so, I think every scientist would agree. Scientific theories are always provisional, subject to change on new information. Still, well attested theories, such as general relativity (which became ever more attested after LIGO’s detection of gravitational waves), undeniably have at least a strong approximation of reality, at least at the scales that we can currently observe. After reading your article it is more clear to me of the difference between proper distance and light year distance but I still can not get the time issue: When the light of the early universe reaches us at this “right now moment”, how is it possible that an event that already happened and that formed us in time, reaches us right now at the speed of light? if it needed billions of (earth) years to form the universe, how come we can still “receive” the lights that comes from an early universe event that already happened billions of years ago?.. what a paradox, can anyone explain? Are you asking how we can see the CMB (cosmic microwave background), since it is the afterglow of the big bang? If so, then the answer is that big bang didn’t start at any one location in space; it happened everywhere in the universe at the same time. We’re not seeing the CMB that eventually became us, but the CMB from another region of the universe. The CMB that eventually formed us would be visible to an alien who is currently ~46 billion light years away (in proper distance). Or did I misunderstand your question? Well, the speed of light is the fastest speed in the universe, but it is still finite (~300,000 kilometers per second). Of course, in normal everyday life, that speed is so fast that it feels instantaneous. But the distances in space are vast enough that the finite speed becomes increasingly noticeable. When we look at the moon, we’re not seeing it as it looks that instant, but as it looked a couple of seconds ago. When we look at the sun, we’re seeing it as it look about 8 minutes ago. The farther into space we look, the further back in time we’re looking. The nearest star is over 4 light years away, so when we see it, we’re seeing it as it looked over 4 years ago. The Andromeda Galaxy is 2.5 million light years away, so when we see it, we’re seeing it as it looked 2.5 million years ago. When we’re looking at galaxies billions of light years away, we’re staring into the past of the universe, and looking at things at that distance allows us to observe the evolution of the universe. The farthest thing away that we can see is the CMB, which has been traveling for 13.8 about billion years. Hope that makes sense. Incidentally, this is also why NASA can’t control distant space probes such as Juno in real time, but have to give them instructions and wait for the results, because it takes 48 minutes for the radio signal to travel between Earth and Jupiter. This I knew, but it still doesn’t explain the paradox I see! It has to do with the concept of time I guess. Us on Earth. (the observer) , being able to wait 13.8 billions years for the CMB light to reach us , it means that it is passed 13.8 billions years for the moment of the big bang to the now…hot it is possible the the event of the big bang is still there to see, and is reaching us only now from the distance?… once again, it should mean that in 13.8 billions years of “evolution” we expanded so fast that we won over the speed of light of the big bang of 13.8 billion year?!! It might help to consider that the CMB that we can see is a pale imitation of the actual event. Strictly speaking, we can’t “see” the CMB with our eyes, we can only detect it with sensitive equipment. As the light traveled in space, it became stretched as the space around it expanded, so that today that light exists in the microwave part of the electromagnetic spectrum. In future eons, it will become further stretched into the radio spectrum, and then eventually be undetectable. Astronomers trillions of years (if there are any) from won’t be able to observe any evidence of it. Eventually, due to the continuing expansion, galaxies outside of our local cluster won’t be visible anymore. Memories of the early stages of the universe where a much wider expanse was visible and an afterglow of the beginning might be regarded as hopeless legend by then. -this expression makes me some problems. -could you write it a little differently? I suppose I could have written “with space growing in the intermediate distances” or maybe “with space growing in the intermediate regions”. It’s a difficult concept to get across with normal language, which is why so many science communicators resort to balloon metaphors. I can, and agree. But what I was trying to convey in the passage you quoted, is that space is growing everywhere, so that the farther a galaxy currently is away from us, the faster it’s moving away. The relationship is referred to as the Hubble constant, at around 70 km/s/MPc. So a galaxy one megaparsec (about 3.26 million light years) away would be moving away at about 70 km/s, but one 10 megaparsecs away would be moving away at 700 kms/s. Do you find that explanation more clear? – of course that’s true. but my simplification results from different context. “more clear?” – i still think, so it will take some time. a short (little) sentence, and describes the possibilities for all humanity. I remember reading that, but I can’t recall what he said afterward. Do you have the URL to that post? I couldn’t find it with a quick Google search. Thanks. I actually hadn’t read that particular one yet. He mentioned the discrepancy in another post a while back, but this one was interesting. I had no idea that parallax measurements were suspected of being that far off. I wonder how the understood distances to the nearest stars will be affected. Thanks for this article. Fascinating. Think of it this way. A colony is set up on the exact edge of the Hubble radius tomorrow. Due to the expansion of space, it crosses the threshold a second after being founded. There can no longer be any contact between us and this colony but, due to our shared history and our shared conceptual frameworks, the systems of meaning we’ve imposed on the universe will still exist, still be connected, still be expanding consciousness farther into the void. What we think, what we believe, how we explain things will be expanding, in effect, faster than light. Interesting thought experiment. The thing to remember is that the radius of the Hubble sphere is always relative to the observer. If I colonize a world on the edge of Earth’s Hubble sphere, assuming there are other colonies in between, as space expanded, I would still be within the Hubble sphere of my neighbors. I could communicate with my neighbors, but no message could ever make its way back to Earth, nor could any message from Earth ever reach me. And the expansion would continue on relentlessly, so everyone’s sphere of possible interaction would always includes less and less of what it had before. Of course, we’re talking about distances of billions of light years (14 billion light years in “proper” distance), so we’re not talking about ongoing conversations being cut short. What’s interesting is I might still receive old messages from Earth for eons after we’ve moved outside of each other’s Hubble spheres. Those messages would become increasingly red shifted and time dilated, until from my perspective Earth would essentially be frozen in time. The universe is strange, and at times dismaying.